Construct groups of matching cards, called Blooms to rack up your HIPs (Human Intelligence Points) and save the future of humanity. Points increase exponentially as you build your blooms and be the first to play all your cards in hand. Beware and play smart! Emptying your hand before building up your points could mean disaster. But holding on to your cards could mean a bigger disaster is looming. I also complete two new VINES each month and share them with you. As with the typical puzzle, you'll want to utilize the handy reference images. We have provided free downloads HERE and each box contains a code to unlock the 7 FT tall printable download of Chapter One for your personal printing use. But you’ll need mad observation and strategic thinking to master this game! 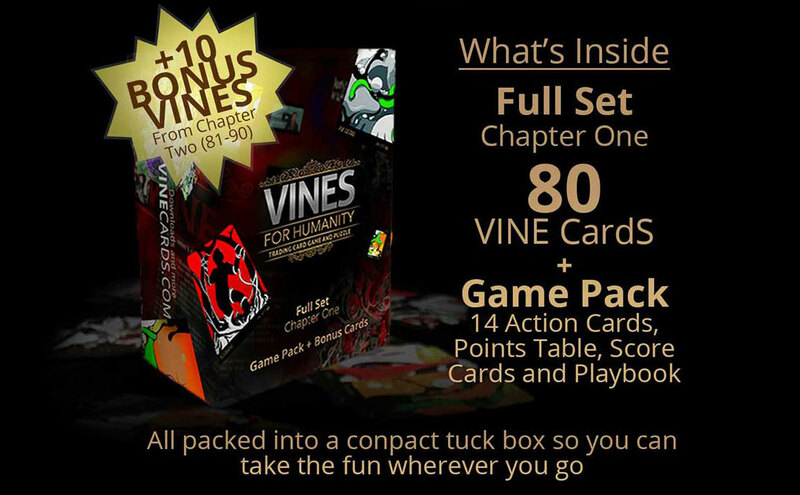 Add new VINE Cards to your collection and bring in more players (20 cards for each new player).